Governing Thoughts: Policies, policies, policies - and some that are not! 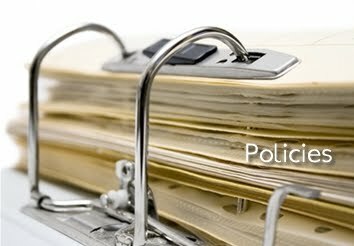 Policies, policies, policies - and some that are not! As part of our ongoing journey to convince our Ofsted Inspector that we are doing well enough to be released from Special Measures, we have been looking at every policy the school has/needs - after all, governance is about much more than 'simply' improving performance and anyway these Policies should be such as to aid, in some way, the performance of the school. First move - ask our LA for a comprehensive list of those policies that we are required to have. We got a useful, and somewhat daunting, list of 36 documents they think we must have. Well, here's the DfE list - 23 items and by their own admission it might be out of date and only covers Statutory Policies and not any 'required' by statutory, or indeed any other, guidance. a Pay Policy when our pay rates and terms & conditions of employment are determined nationally? an Admissions Policy when admissions are determined by the Local Authority? ...and a host of other bits of paper that could be generalised by the LA who control such maintained schools and are ultimately responsible for many aspects of their operation? It seems to me that hours must be wasted writing/re-writing/badging documents that could be handled much more efficiently by one person in the LA. Indeed, at one school where we found a serious lack of formally approved policies, we simply went through the model LA ones and put our school name in them. It took hours, achieved nothing other than satisfying some box-ticker from Ofsted that we did have policies in place. But we were 'legal'! Let's get on top of the bureaucratic burden - I know we need to ease it for teachers, and we need to ease it for governors too not least because we volunteer our limited time and I would rather spend it on topics over which we have some direct influence.